Just before his journey to Öland and Gotland in 1741, Linnaeus had been appointed to the chair of medicine at Uppsala University. One of the first things he did was to restore the neglected Botanical Garden. 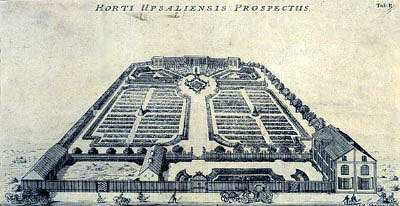 The Hortus Upsaliensis (University Garden) in the mid 1740's after the changes made by Carl Hårleman and Linnaeus. Illustration from Linnaeus’ thesis "Hortus Upsaliensis" 1745. The Garden had been laid out by Olof Rudbeck Sr in 1655 and had in his time become richer in species than most in Europe. It contained 1870 species, 630 of them foreign. The great city fire of 1702 ruined the garden and now, at last, someone was seriously prepared to take care of it. All the Siberian corydalis, Corydalis nobilis, found in the Linnaeus’ Garden today, originate from the seeds sown by him. In spite of the fact that the garden closed down after Linnaeus’ death, his Siberian corydalis survived as a weed. Uppsala University commissioned the famous architect Carl Hårleman to design the garden in an attractive way. 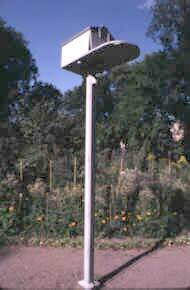 He designed a greenhouse with small wings and gave the flowerbeds handsome shapes. Linnaeus filled them with plants according to his own teaching methods and sent for the skilled gardener Dietrich Nietzel from Holland. The Garden now became a "living textbook" where you could wander among the plants finding examples of all the classes in Linnaeus’ sexual system. another. Medicinal and other useful plants dominated since the garden was, of course, primarily intended for the teaching of medicine. Three ponds were made for plants typical of streams, lakes and marshes. Thus Linnaeus demonstrated ecological context long before the word ecology came into use. A statue of Venus was placed in front of the central pond. In one part (area vernalis) near the orangery Linnaeus placed the plants that bloom in the spring, in another (area autumnalis) those that bloom in the autumn. Round about the entire garden different species of trees and shrubs were planted. In the orangery, the greenhouse, Linnaeus’ tropical plants were kept – among them a coffee bush, bananas, rice and tea (the latter soon died). Linnaeus was able to send bananas of his own growing to the King and Queen in Stockholm. Altogether he grew around 2157 species in his garden. However, there were also animals in Linnaeus’ garden. Parrots shouted here, imitating Linnaeus’ voice: "Blow your nose!" Monkeys played around and a racoon wanted to be petted. Peacocks strolled about displaying their beautiful plumage. Goldfish swam in the pond. Linnaeus acquired a great number of plants and animals for his garden from many different sources. King Adolf Fredrik and Queen Lovisa Ulrika, who both had considerable natural history collections, gave him several animals. Other royal families, scientists throughout the world, the Swedish East India Company and his own pupils on their travels, all sent him animals and plants but above all, seeds of many plants. Linnaeus bought some, but people from the province of Småland are notoriously careful with money and when in 1753 he received a catalogue from a Dutch dealer in animals he was horrified by the prices. "My hair rises on my head and fleas bite at the roots when I contemplate the catalogue. 300, 100, 50 guilders: in sum the cost of a cavalryman and his horse. All the beasts are splendid, but money more splendid." Linnaeus was never far from his garden. The professor's residence lay in a corner of the garden and here Linnaeus spent the rest of his life. Linnaeus kept many animals in his gardens. During the summer his monkeys lived in "monkey huts" like this. The monkeys were chained to the pole and could hide up in the actual hut. Linnaeus kept a racoon in his garden. Painting by Lars Alstring at Linnaeus’ Hammarby. In our day, Linnaeus’ town house has become an exciting museum where you can also visit his study.